In celebration of Valentino's latest flagship store in Shanghai, designers Maria Grazia Chiuri and Pierpalo Piccioli designed a special collection which was presented in Shanghai, China on November 14, 2013. Taiwanese actress and host, Lin Chi Ling (林志玲) wore a dress with full skirt from Valentino Spring 2013 Haute Couture collection. A pair of lace pumps to match her dress. 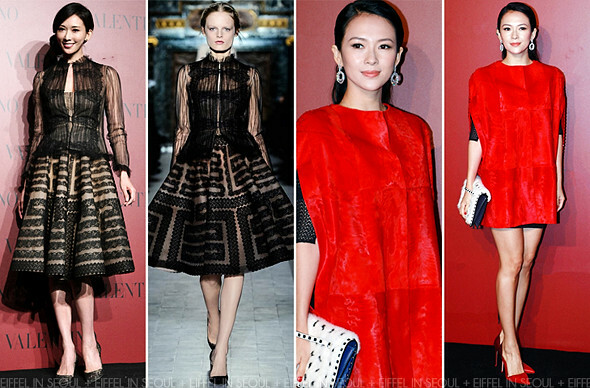 Zhang Ziyi (章子怡) wore a black dress with a red sleeveless cape. A fur clutch and red pumps to complete her rather disappointing outfit.